We print digital like no other! We print high quality print using the environmentally friendly HP Indigo digital printer. By printing on our HP Indigo we use less electricity and waste almost no paper compared to Litho printing, so this makes good economic sense and produces a high quality end product! HP Indigo presses are designed with the environment in mind: manufacturers take into account the full product lifecycle, supply chain and end of life. 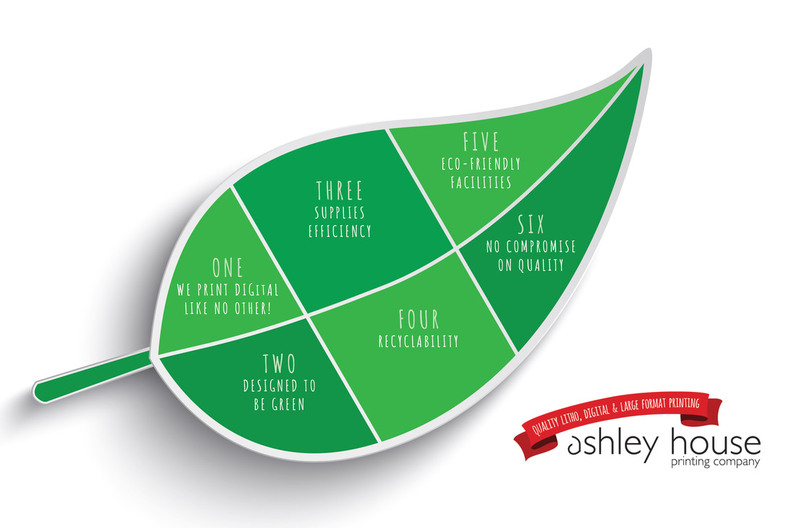 That’s why HP Indigo presses are the right solution for Ashley House, as we are committed to maximising the benefits of digital print for the environment, including reducing waste and power consumption per printed page. HP Indigo supplies are developed to minimise environmental impact, including a longer lifespan meaning fewer replacements and less waste, boosting overall productivity. From the initial design phase, HP Indigo engineers recycle and reuse its parts by choosing suitable raw materials. HP Indigo also runs take-back programmes for presses and parts. All HP Indigo facilities are ISO 14001 certified and HP Indigo established a programme in collaboration with Good Energy Initiative to offset carbon emissions associated with the manufacturing of new presses. This helps us at Ashley House to minimise the environmental impact at our facility by using our HP Indigo printer. No Compromise on Quality, it’s the best quality digital print available! Our HP Indigo press produces high quality and environmentally friendly print. The Indigo ‘Electro Inks’ have amazing vibrancy like no other printing process, especially on uncoated stocks. We can print on a wide range of paper and vinyl stocks up to ‘400gsm’. We now have digital ‘White Ink’, perfect for creative printing onto dark papers and cards. Overall HP Indigo printing will have less impact on the environment. We would highly recommend this in place of Litho printing, if you or your client are eco aware. We&apos;d love to hear your ideas for creative use of our Digital Press. If you’d like to talk to us about your next project, call us on 01392 20 23 20.